This is Mike Ritchie. 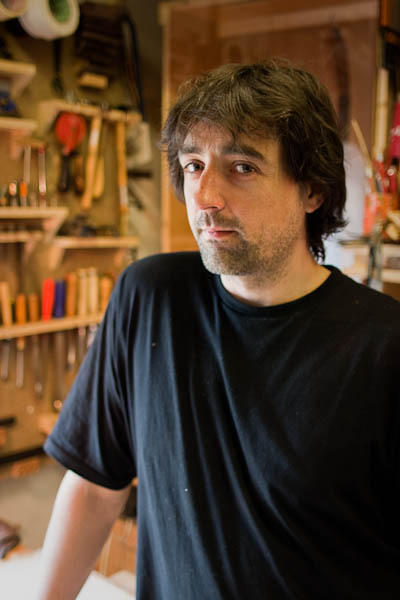 Mike is a Luthier (guitar maker if you must). This was taken yesterday in his workshop. Mike made my acoustic guitar 6 years ago and it is the most wonderful sounding guitar I have ever owned. Mike puts real passion and love into his guitars, and the results are really special. He does everything by hand and has incorporated new methods into his building process as he has learned from other builders. (He recently had 2 years in Spain learning from their builders). It is a total pleasure to chat with Mike and watch him at work. He just happens to be a really likeable man who is a pleasure to chat with as well. I ‘m grateful that he was happy to let me do a portrait and I look forward to more in the near future. This is such a beautiful image Matthew – I am not surprised you wanted to keep the workshop in the frame. I’d LOVE a handmade guitar but think that will need to wait for a while!